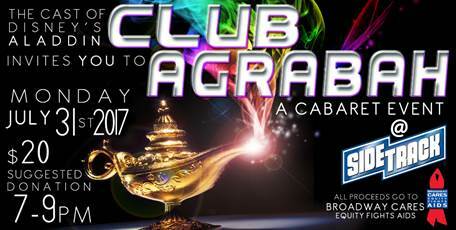 Cast members from Disney’s Aladdin will present CLUB AGRABAH: A CABARET EVENT, a live cabaret-style concert, on Monday, July 31, 2017 from 7-9PM at Sidetrack Video Bar (3349 N. Halsted St., Chicago). Aladdin cast members will perform a selection of their favorite songs, and the concert will be followed by Sidetrack’s signature ‘Musical Monday’ which features show-tune videos that play throughout the bar until 2AM. There is a $20 suggested donation at the door for CLUB AGRABAH: A CABARET EVENT. To learn more about Sidetrack Video Bar, visit www.sidetrackchicago.com. All donations and money raised go to Broadway Cares/Equity Fights AIDS, one of the nation’s leading industry-based, nonprofit AIDS fundraising and grant-making organizations. By drawing upon the talents, resources and generosity of the American theatre community since 1988, BC/EFA has raised more than $225 million for essential services for people with AIDS and other critical illnesses across the United States. To learn more, visit www.broadwaycares.org. Disney’s ALADDIN is currently playing Broadway In Chicago’s Cadillac Palace Theatre through September 10, 2017.